His Divine Grace A.C. Bhaktivedanta Swami Prabhupada is the foremost Vedic scholar, translator, and teacher of the modern era. He is especially respected as the world’s most prominent contemporary authority on bhakti-yoga, devotional service to the Supreme Person, Krishna, as taught by the ancient Vedic writings of India. He is also the founder-acharya of the International Society for Krishna Consciousness. Srila Prabhupada’s spiritual master, Srila Bhaktisiddhanta Sarasvati Thakur, was the leading proponent of Krishna consciousness in India during the early part of the twentieth century. He specifically taught the philosophy of Chaitanya Mahaprabhu, the divine avatar who revived Krishna-bhakti all over India in the 1500s. When Srila Bhaktisiddhanta first met the young man later known as Srila Prabhupada – in Calcutta in 1922 – he urged him to preach Chaitanya Mahaprabhu’s message of Krishna consciousness throughout the English-speaking world. After forty years of struggling within India to carry out his guru’s order, while maintaining family and business responsibilities, Srila Prabhupada boarded a steamship bound from Calcutta to New York City in 1965. The journey proved to be treacherous and he suffered two heart attacks aboard. At age sixty-nine, with forty rupees and a trunk of his Bhagavatam commentaries – the first ever in English – his aim was to introduce “India’s message of peace and goodwill” to the western world. During the last twelve years of his life, Srila Prabhupada would inspire thousands of Westerners and Indians to devote their lives to Krishna consciousness, launching one of the fastest-growing spiritual movements in the history of the world. He considered his translations and commentaries as divinely inspired, practical guidebooks for the spiritual and material benefit of human society. Many scholars and professors who met Srila Prabhupada and became familiar with his work continue to use his books as standard university texts, and regard him as a genuine, realized, and scholarly teacher of bhakti. 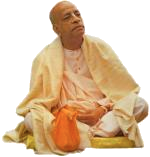 With the help of his students, he founded the International Society for Krishna Consciousness (ISKCON). ISKCON is popularly known as the “Hare Krishna” movement, due to its members’ widespread practice of chanting the Hare Krishna mantra in public. Srila Prabhupada intended ISKCON to facilitate the association and education of bhakti-yoga practitioners, and his followers continue to spread that mission. "Human prosperity flourishes by natural gifts and not by gigantic industrial enterprises. The gigantic industrial enterprises are products of a godless civilization, and they cause the destruction of the noble aims of human life. The more we go on increasing such troublesome industries to squeeze out the vital energy of the human being, the more there will be unrest and dissatisfaction of the people in general."